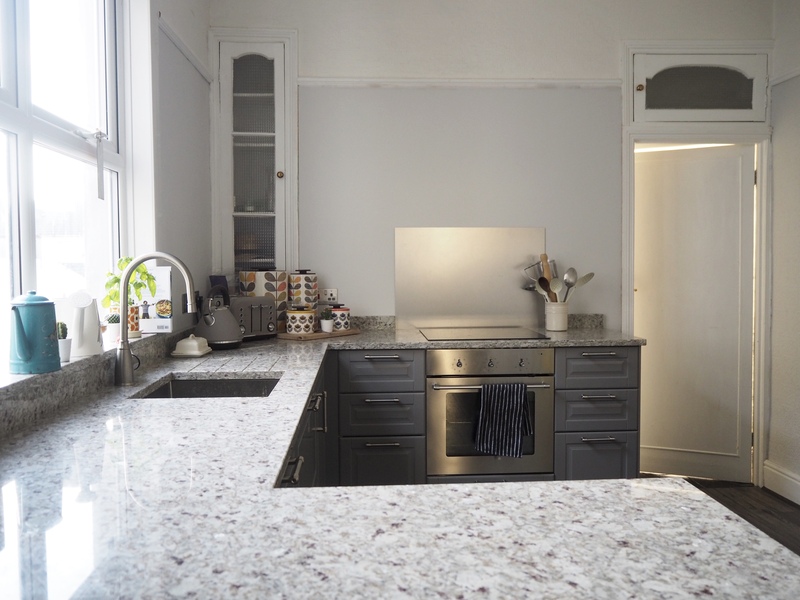 A WHILE ago I wrote some posts about our IKEA kitchen makeover – the before pics, and progress half way through. It’s taken a while, but I’m finally ready to share the final result! Ok, there are a couple of little bits to finish off, but if I wait for all the tiny things to be done I’ll never get round to it. We desperately needed a new kitchen after making do for four-and-a-half years, and last year we suddenly went for it. We visited a few stores to get ideas, and settled with IKEA after hearing good things about the range and service. 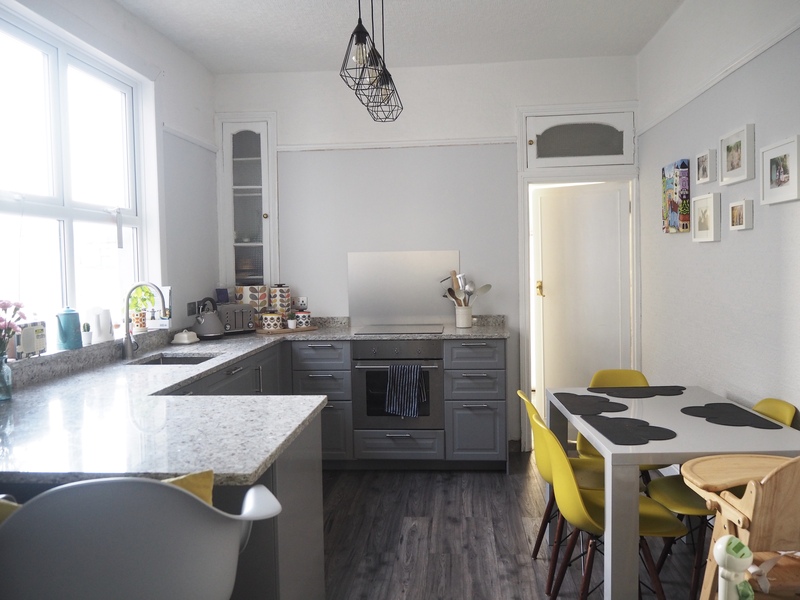 After a consultation with our IKEA kitchen designer we decided to move the kitchen itself into our old dining room to create one more functional family space. We went back and fore a few times to make sure the design was right, and then moved on to the details. 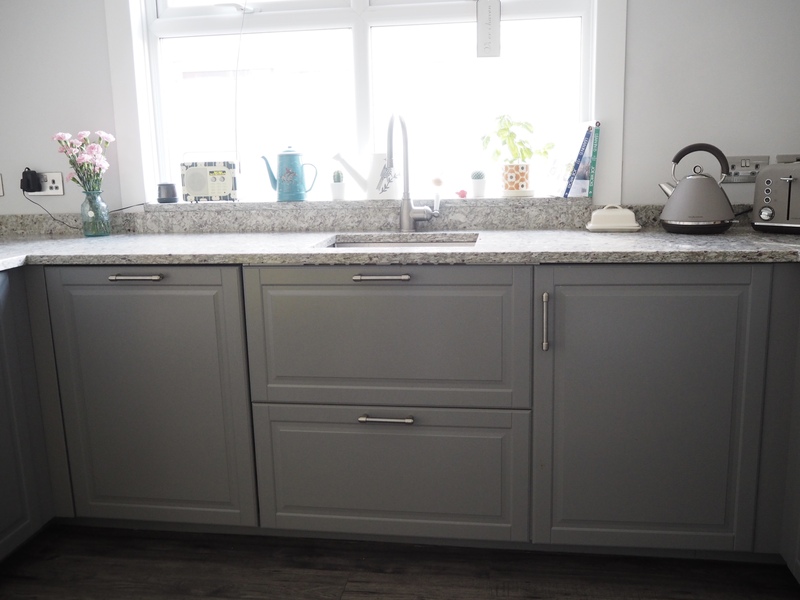 From the start I wanted grey units, with a lighter grey worktop, and for everything to be sleek and easy to clean. Our old kitchen had wooden worktops which we didn’t maintain properly and turned into a bit of a mess … we weren’t making that mistake again! We went for Bodbyn units in grey as the style of the door is quite traditional and would fit with our old house, but the colour is nice and modern. To keep the design sleek we chose handles from the Varnhem range. One of the best things about IKEA was the amount of choice with all the little things. Who’d have thought you could spend so much time looking at handles and taps! 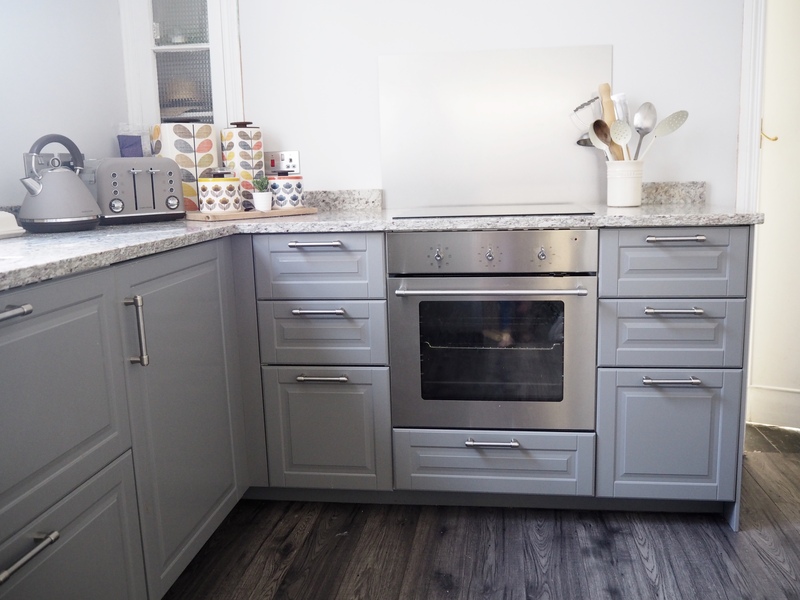 We also have an inbuilt oven and an induction hob, which are both from IKEA, and a dishwasher – we debated having one but now I have no idea why we doubted the decision! Best invention ever. 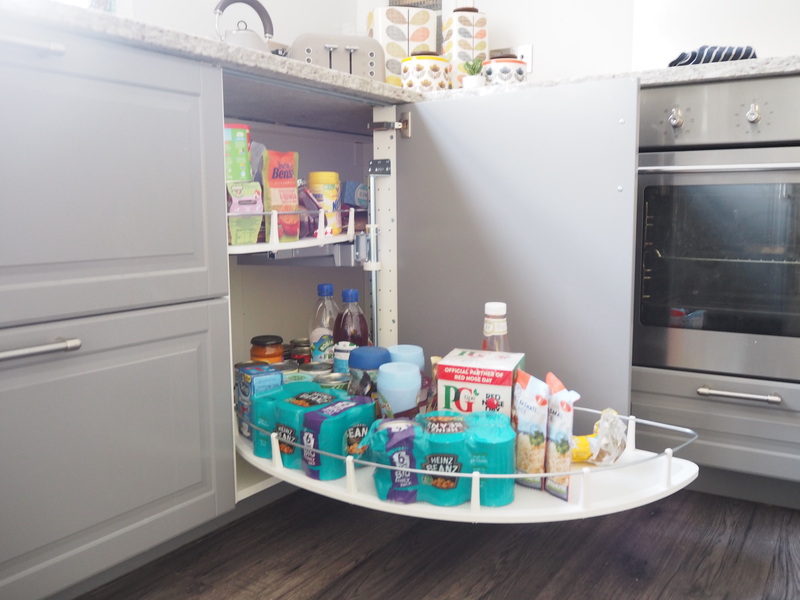 Cupboard-wise, we have two huge corner units with carousel shelves, which fit a crazy amount of food, two sets of drawers for cutlery, pots and pans, and two big drawers under the sink for the food bin and cleaning items. It doesn’t sound like much, but we hardly had any storage before so didn’t want to go overboard with loads of units we would just end up filling. Four shelves of this size is plenty! When we first started thinking about having the kitchen done, I mentioned that I’d love a breakfast bar. 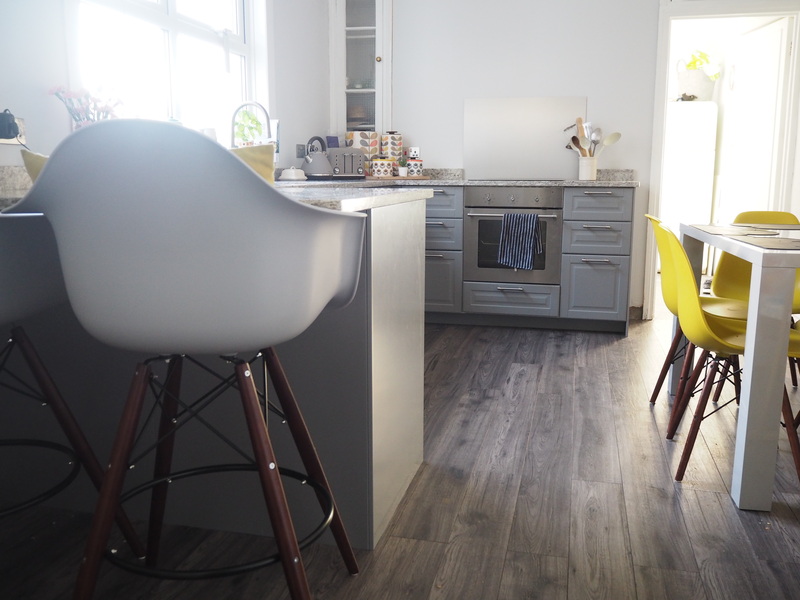 I don’t know why, but I liked the thought of sitting on a high stool to blog or have a cup of tea, and when the IKEA kitchen designer suggested it would fit well I was so happy! We now have a u-shaped kitchen with a breakfast bar looking across the room. 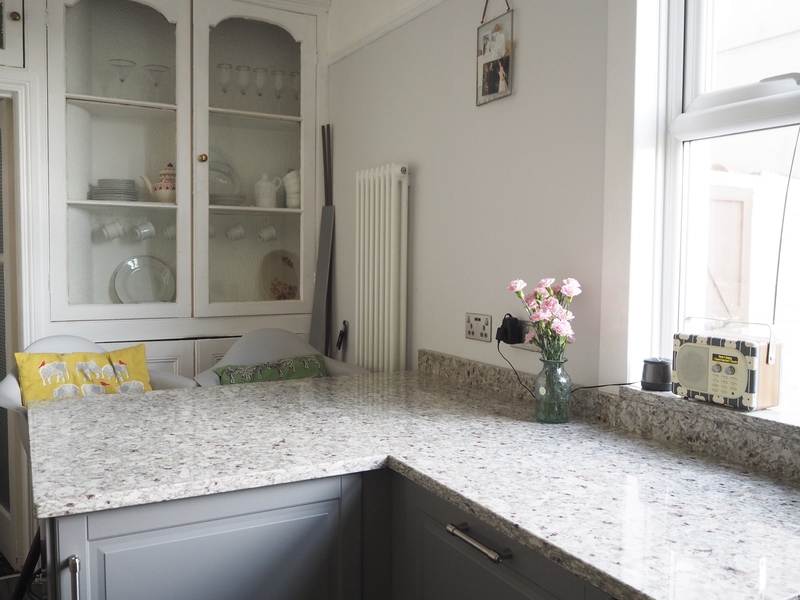 One of the biggest expenses of the whole kitchen was the worktop because we went for granite rather than laminate. It more or less doubled the entire cost of the room, but I think it’s well worth it. 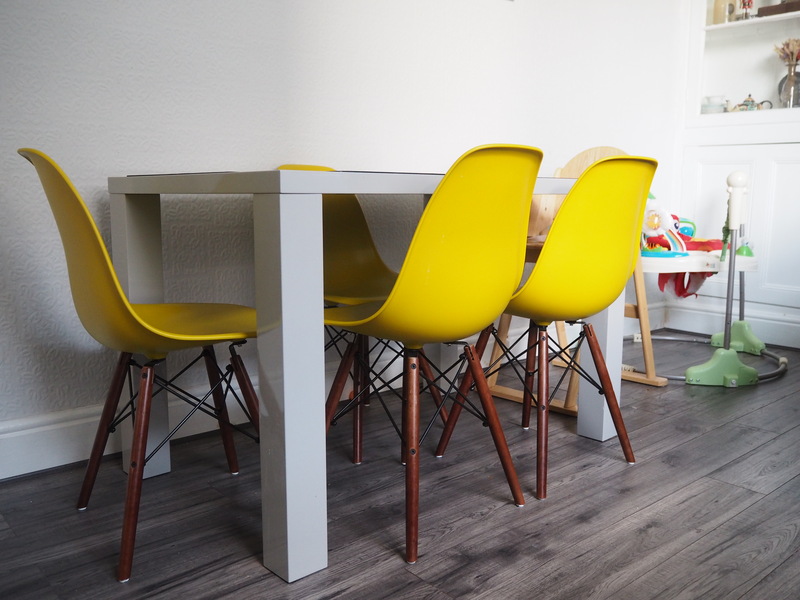 With two boys we need a really hardwearing surface that can withstand practical anything, and I was worried laminate would get scratched quickly. Plus, the IKEA kitchen units are so reasonably priced we had leeway within our budget to splash out on the worktop. We stuck with laminate in the utility room as it won’t be used to much. We shopped around and found there’s a big difference in prices between suppliers, and ended up going with a local supplier called West Wales Marble and Granite. The staff were amazing – they understood that it was a huge decision because of the cost and were more than happy for us to visit the workshop as many times as necessary to make sure we chose the perfect colour. 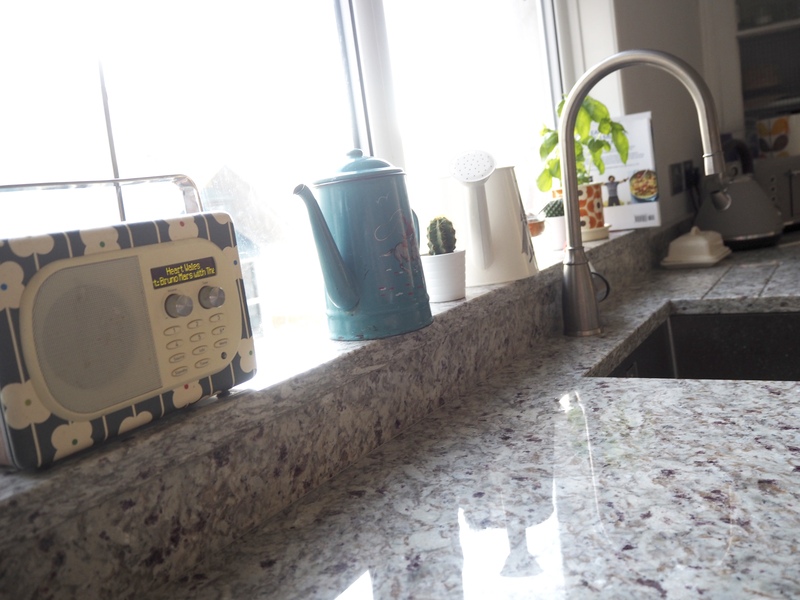 We chose to have a granite upstand instead of tiles along the walls, and drainage grooves for our inset sink instead of a traditional draining board. They even designed a granite windowsill because the units come up higher than the window frame, which really sets the room off. I can’t recommend them highly enough. 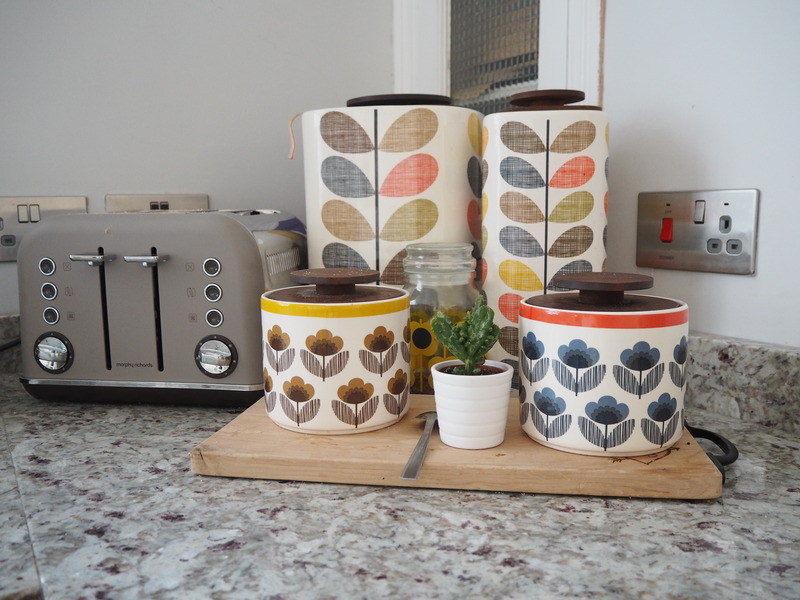 For the finishing touches on the kitchen side of the room we bought a grey kettle and toaster from Morphy Richards, and added a splash of colour with my collection of Orla Kiely jars and containers. 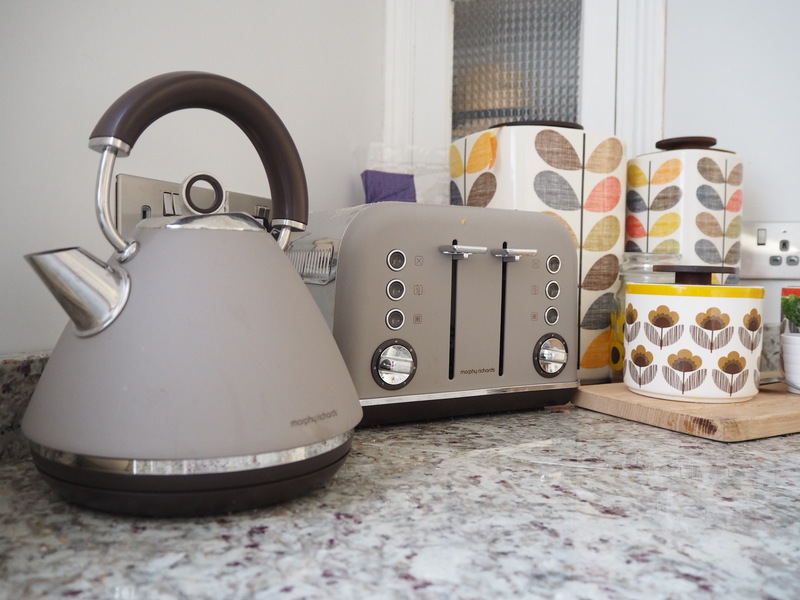 We also have an Orla Kiely DAB radio and plant pot (which nothing survives for long in … but that’s down to our poor skills), two watering cans as vases and a couple of cacti thrown in. You might be able to tell I have a bit of an obsession with Orla Kiely prints! We considered creating a feature wall with her wallpaper and a clear splash back over it behind the cooker. We weren’t quite brave enough in case it clashed with the worktop and ended up buying a plain silver splash back instead. 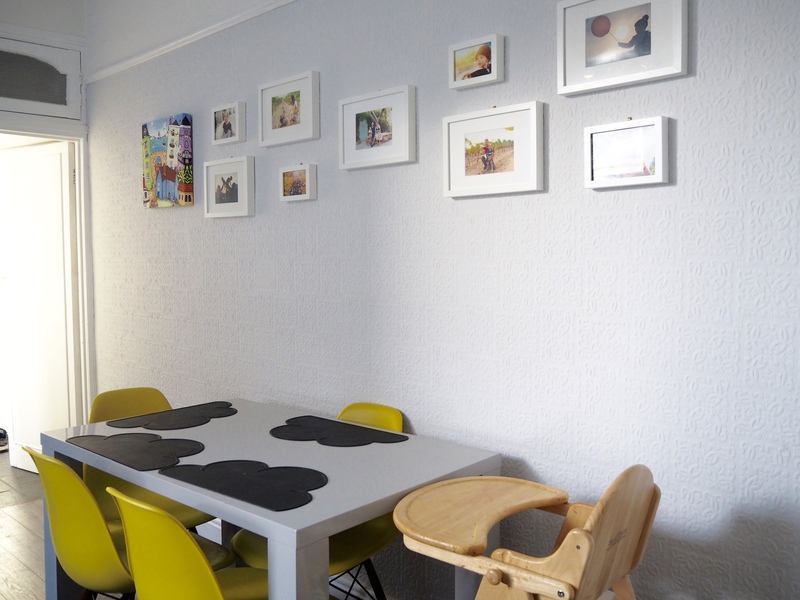 Over on the dining room side we have a plain grey table and yellow chairs. I have to admit, the chairs were a nightmare to buy! I saw some I liked months and months ago, but by the time we were ready to order them they were out of stock … and I couldn’t find a colour I liked anywhere else. 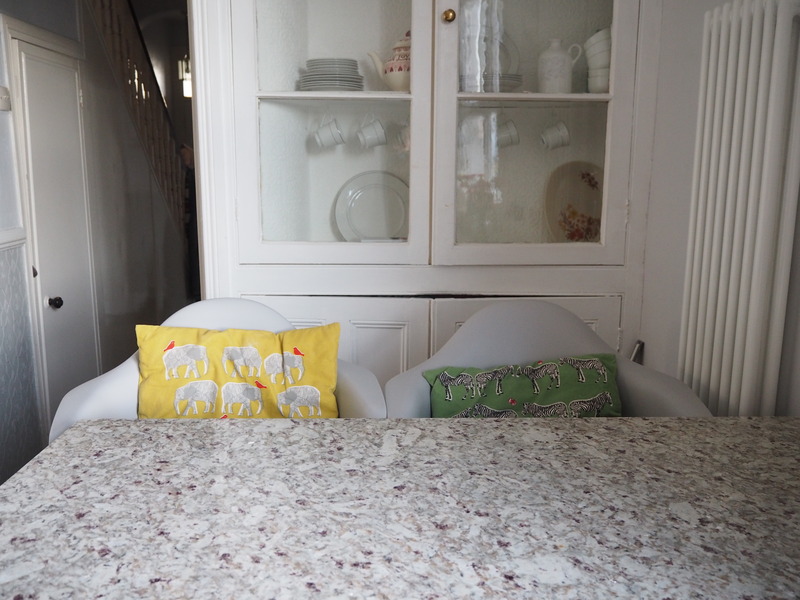 Luckily the yellow goes with the Orla Kiely items and I love them now they’re in place. They’re Charles Eames style chairs from Danetti. The table is also from Danetti and is the Fern gloss grey design. I debated a more retro looking wooden table with hairpin legs, but thought it would be more sensible to have something simple that’s easy to clean. This gloss is so quick to wipe down, just what we need while we’re weaning! 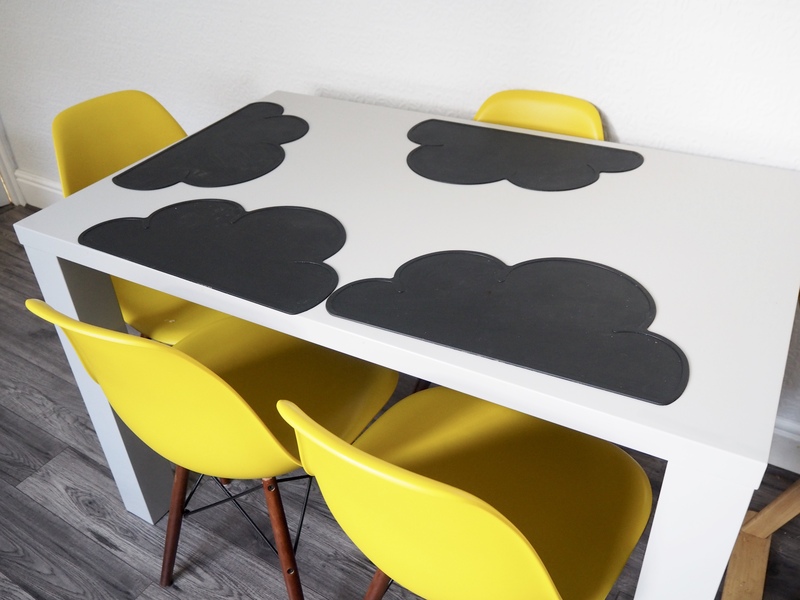 The black cloud placemats are from eBay and come in lots of different colours. Our breakfast bar stools are a similar design to the dining chairs, but are a bucket style. We thought it would be safer to have stools the boys can’t fall out of! The stools just about fit next to each other and were a bit bigger than we were expecting! They’re super comfy though and this is our toddler’s favourite spot to watch Peppa Pig on the iPad. We also put a new vertical radiator in, as our old one was along the wall where the units now are. It’s from Soak. 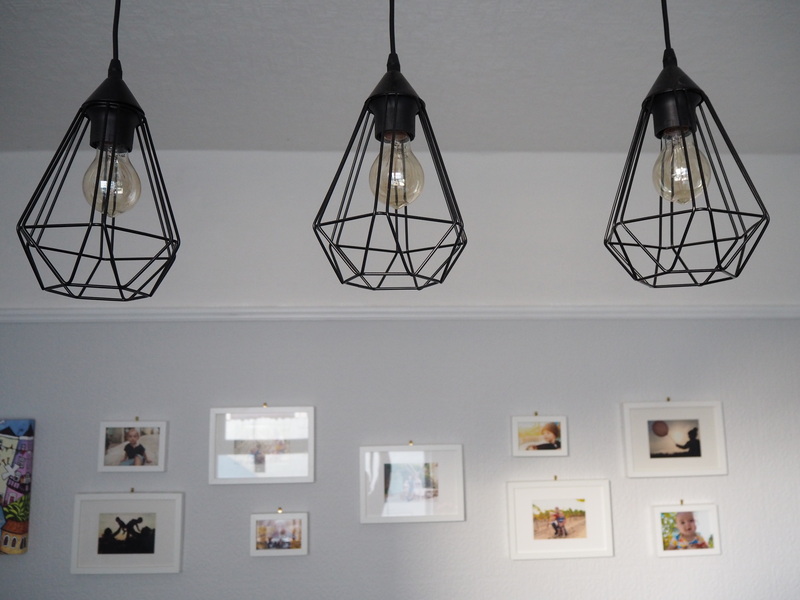 The final touches to the kitchen were the light – a metal cage pendant, with filament bulbs from Wilko to keep the industrial look – and a picture wall, which we were lucky turned out well as there was no planning of the layout or measuring involved! 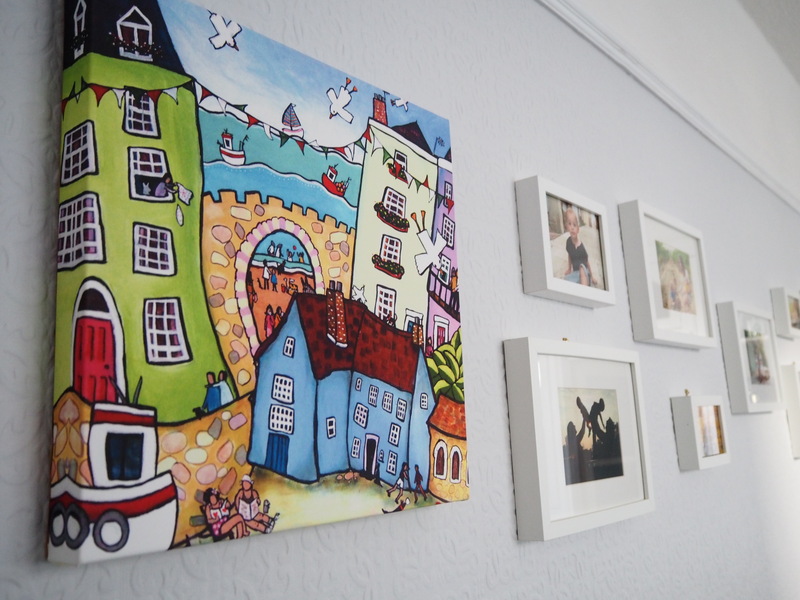 The photos are all in IKEA Ribba frames, which we have throughout the house too! I still can’t quite believe this is our old dining room, it’s such a huge difference. Despite having more in it, the room seems brighter and more spacious now. It’s lovely not having to cook out in the other room, and is so much better suited to family life. I love looking down the passage from the front door and seeing how airy it is. We’re still working on our utility room, which will be through the door where the old kitchen was. At the moment it has our Smeg fridge in, which didn’t quite fit in the new kitchen, another sink, the washing machine and tumble dryer. When that’s all finished I’ll get another post written up!